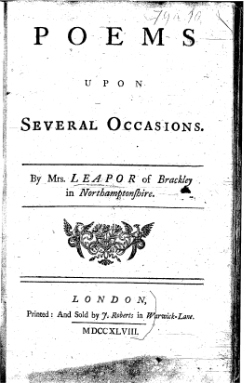 A servant maid who died in relative obscurity at the age of just twenty-four, Mary Leapor (1722-1746) is now considered to be one of the most interesting poets of the eighteenth century. In moments that she snatched from her busy working day, she composed a considerable body of work, both poetry and drama, sufficient to fill two posthumously published volumes (Poems on Several Occasions, 1748-51). In her vibrant and witty verse, Leapor offers a vivid - and often comic - portrait of the world in which she lived, of her family and friendships and of her thoughts on literature, society and religion. Central to her work is the challenge of combining writing with her daily labours and her literary ambitions with society's expectations of someone from her class. Appearing in her own verse as 'Mira', Leapor documents her struggles to find acceptance as a poet within her local community, until the friendship and patronage of Artemisia (a local woman named Bridget Freemantle) provides her with the support she needs to grow and develop as a poet. For other female writers of the time, take a look at Poems by eminent ladies, available as a free eBook. 3 Poems by the most eminent ladies of Great Britain and Ireland. Originally published as: Poems by eminent ladies.